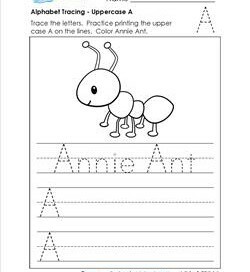 Annie Ant is your partner in crime on this alphabet tracing page for uppercase A. 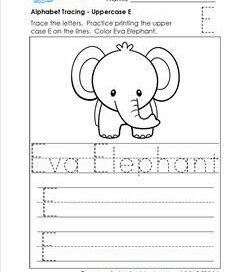 Trace her name and the A’s, practice more A’s and color! 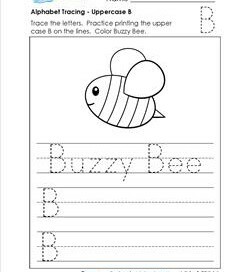 Buzzy Bee is just buzzing by to help you with alphabet tracing, especially the uppercase B. Trace his name, all the B’s, practice some more and color! 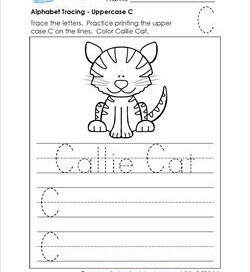 This sweet little Callie Cat is sitting pretty for you while you trace her name, all the C’s, and practice some more. Color her please she says! Dudley Dog is such a happy fella! He’ll be even happier if you trace his name, the uppercase D’s, and write some more. He’d love to be colored, too! 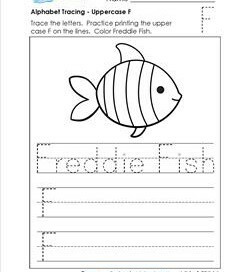 Freddie Fish is swimming by and visiting this alphabet tracing page. He’ll give you a high five fin if you do an awesome job tracing the F’s! Harry Hippo is a fun lovin’ fella! Can you see his mouth movin’? 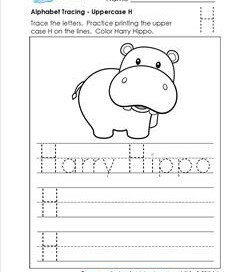 He’s tellin’ you how to trace and write the uppercase H. Have lots of fun with Harry! O.K., so Iggy looks a little spaced out, I know. 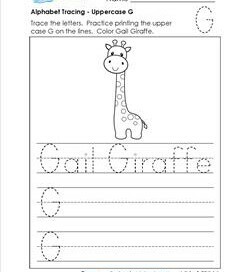 But he’ll be a good friend to help you with this alphabet tracing page. Show him some lovin’. He needs it! 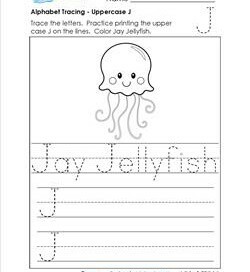 This alphabet tracing page for uppercase J has Jay Jellyfish on it. He’s here to help you gracefully trace his name, the J’s, and write more J’s on your own. Katie Koala is looking right at you. 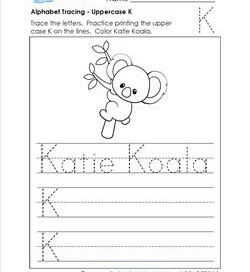 She’s making sure you’re gonna fill out this entire alphabet tracing page with nice neat uppercase K’s. 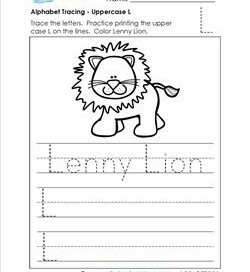 An alphabet tracing page for uppercase L – just what you’ve wanted, especially with a cute and happy lion on it like this one! Trace and write the L’s. Mia Monkey has her hand out, waving to ya’. 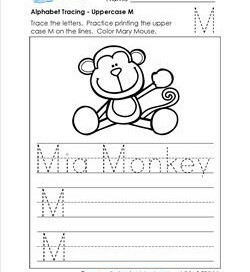 She’s flagging you down to come trace & write some uppercase M’s on this alphabet tracing page. I know you will! 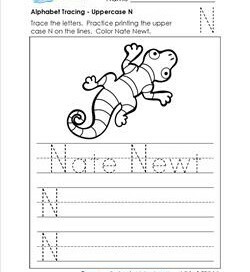 Nate Newt is a creepy crawly kind of creature. 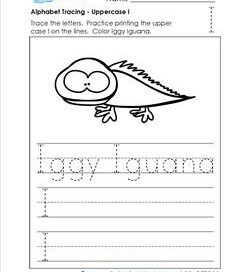 Trace his name & the N’s on this alphabet tracing page. Maybe he’ll crawl off the page & onto you in appreciation! Who, who are you? This is Oliver Owl. 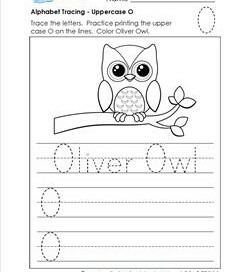 He’s just hanging around, wanting you to come to this alphabet tracing page to practice your uppercase O’s. This alphabet tracing page has uppercase P’s that are standing straight and tall. 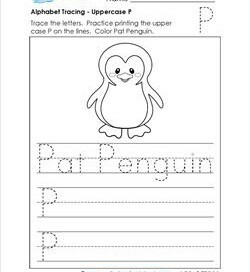 Can you trace Pat Penguin’s name and make more straight and tall P’s?